The racing classic marks the second of the so-called “Danica Double” races and will go down in history as the final motorsports event for the pioneering woman. Her new team, Ed Carpenter Racing, is owned and operated by the only driver/owner competing in the Verizon IndyCar Series. As one of the most experienced drivers in the field, 2018 will be Ed Carpenter’s 16th season of IndyCar competition, and his seventh year of team ownership. Ed Carpenter Racing has qualified a car on the front row of the Indianapolis 500 four of the past five years, including Carpenter’s back-to-back pole positions in 2013 and 2014, and his second place qualifying effort in 2017. At Daytona in February, Danica raced No. 7, which many think is a lucky number, only to have her race end early due to a crash. Danica is scheduled to make her debut behind the wheel of an Ed Carpenter Racing Chevrolet on March 29 during a Chevrolet test session at Indianapolis Motor Speedway. She’s looking forward to getting back into an Indy car, which has been updated with a universal aero kit for this coming year. The manufacturer modifications return the cars to a downforce more akin to the open-wheel car Danica drove before shifting to stock car racing following the 2011 Verizon IndyCar Series season. Carpenter, an entrepreneur and long-time GoDaddy customer, has a reputation for excelling on oval tracks and running a close-knit team. He owns the Indianapolis-based race team alongside local businessmen Tony George and Stuart Reed, who are revved up to be adding Danica to their lineup. “This is a once-in-a-lifetime opportunity – to be the team powering Danica in her final race, and to do it together here in Indianapolis is especially significant for ECR. When you consider Indianapolis Motor Speedway is where Danica first made her mark in racing, it’s easy to see why this is the perfect way for her to end her career,” said Carpenter. In addition to being the only woman to win a Verizon IndyCar Series race, the Indy Japan 300 in 2008, Danica has an impressive track record at Indianapolis Motor Speedway. In 2005, her “Rookie-of-the-Year” season, she made history as the first woman to lead laps at the Indianapolis 500. 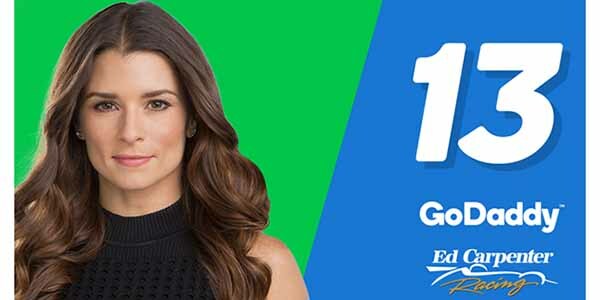 Seeing her grit in that early-career competition inspired GoDaddy to sign Danica the following year. In seven attempts in the marquee race, she earned six top-10 finishes, qualified on the second row in 2008, and in 2009 she finished third, scoring the highest finish for a woman. Danica is not waiting to retire before flexing her creative side. Earlier this year, she helped design her new Danica Double logo. Now she’s working on the design of her own IndyCar firesuit. GoDaddy is supporting Danica’s life-after-racing by powering the online presence for her business endeavors related to health, apparel and wine – all of which are enriched with her brand, and GoDaddy’s savvy in helping people turn their business dreams into reality.